Data transfer via light is regarded as a very promising method in communications technology to transfer ever bigger amounts of data at ever higher data transfer rates across long distances. The achievable transfer rate is limited by the interface at which the light waves, emerging e.g. from a glass fibre cable, are converted into electronic signals. Here, photo detectors are applied that usually make use of absorption in semiconductor materials in detecting light.In contrast, KIT scientists at the Institute of Institute of Microstructure Technology (IMT) have developed a novel high-speed photo-detector which makes use of internal photo emission to detect light - excited by light, electrons emerge from metals and are evaluated as signals. This enables the spatial requirements of the detector to be reduced to less than a square micrometre, while data rates of more than 40 gigabits per second can be attained. It is possible to generate and detect electromagnetic waves at several hundred gigahertz. This wide range is enabled by the electrodes being only a small distance from one another, which is facilitated by the new structural concept. It is based on the scientists combining gold, silicon and titan as a metal-semiconductor junction in a special geometry the cross-section of which is reminiscent of the sign Pi (? ).The electrodes are kept apart solely by a 100 nanometre thin silicon layer. The detector can be integrated in an integrated circuit, especially in a Photonic Integrated Circuit (PIC), on a silicon basis. 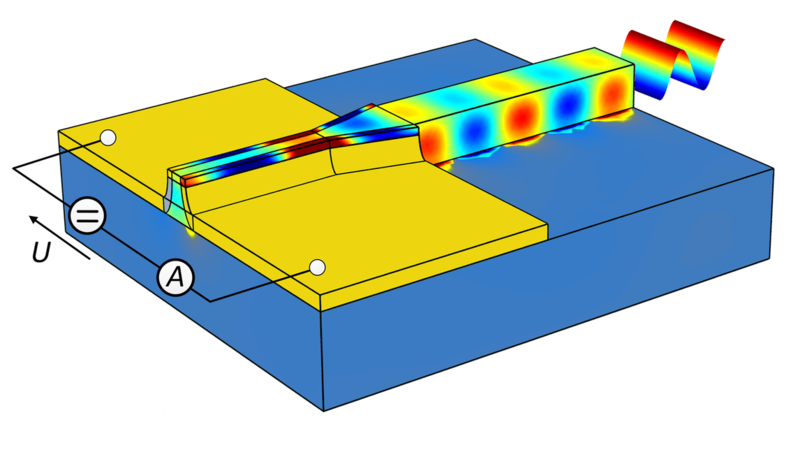 Here, a mode converter conveys the light signal from the silicon wave conductor to a surface plasmon in the detector. This plasmon features highly-concentrated electromagnetic waves that enable an efficient use of internal photo emission. The plasmonic photo detector was manufactured in a multi-step process at the Institute, involving the use of low-cost standard procedures such as lithography, dry etching and steaming.